3:30 PM - 4:30 PM Video Game Hour! Workshop is suitable for participants over 18. Space is limited at this popular event. Advance registration is required and will open HERE on Monday, April 22 at 9am. Ages 5+ Drop-in with a caregiver and make a mother's Day card together. Supplies provided. 4:30 PM - 5:15 PM Let's get Trivia(l)! ~~It’s Bird! It’s a Plane! It’s . . . Graphic Novels for kids! Our newest book club offering takes place monthly on afternoons @4:00-5:00 PM during the school year. 6:30 PM - 7:30 PM Matt Heaton's: Toddlerbilly Riot! Pop-Up Art School combines art history and hands-on learning to teach a variety of art techniques to kids. These creative, informative and fun workshops focus on famous artists. Imagine making your own toy that propels a rocket into the eye of the man-on-the-moon. Join us to create and assemble your own! Make one like ours or use your own imagination.You'll learn about pulleys and about the filmmaker and movie that is the inspiration for this project. You'll leave the workshop with a fully assembled art project. Get ready for the countdown to launch yourself into summer! For ages 8-12. Registration is required and will open two weeks prior to the program. 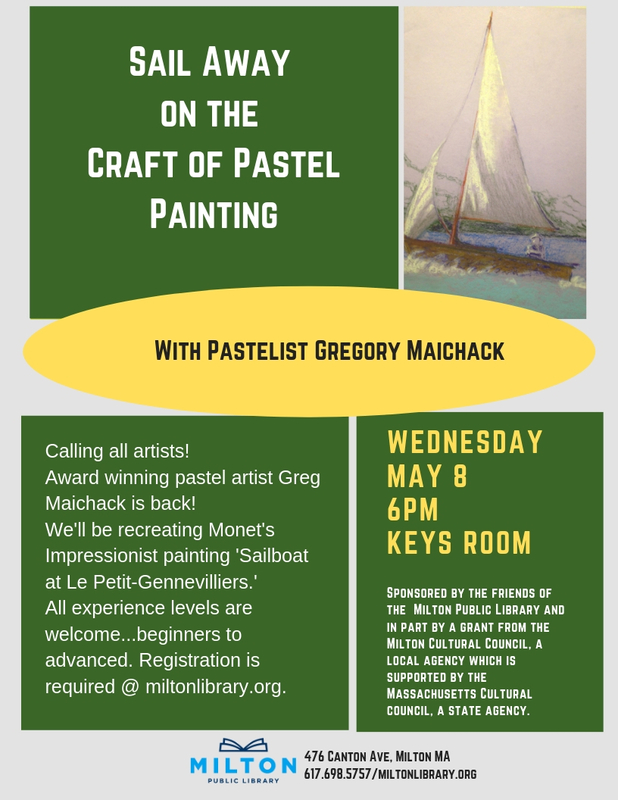 Sponsored by the Friends of the Milton Public Library. Calling all Summer Readers! It's time to celebrate your summer reading achievements. Please join the Children's Room staff, and the Friends of the Library for games, prizes and ice cream! This event is open only to registered participants in the library's Summer Reading Challenge and their immediate families. No registration required. 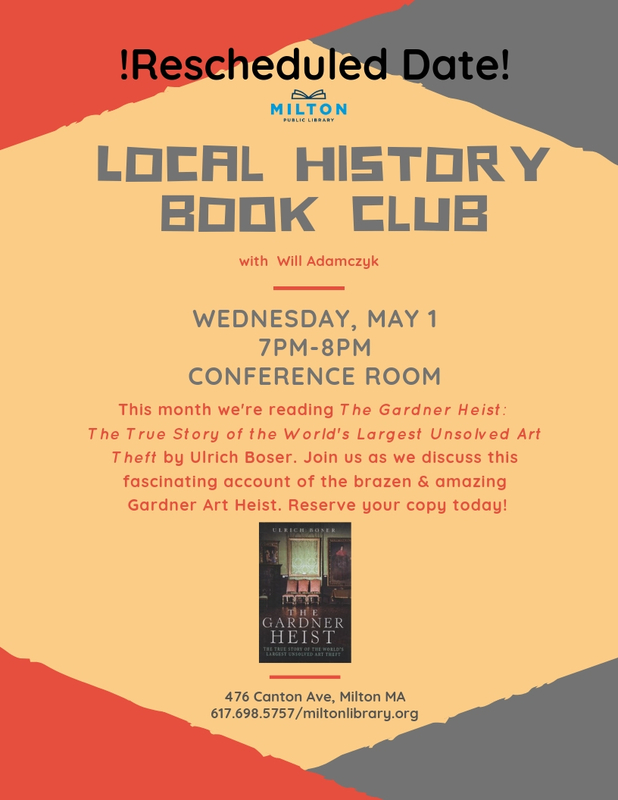 Friends of the Milton Library monthly meeting takes place immediately before a special author event with Hallie Ephron who will introduce her newest mystery, Careful What You Wish For. Refreshments will be served and Friends members get advanced seating for the author's talk. Hallie brings her newest mystery to her hometown and the Milton Public Library. Careful What You Wish For is inspired by Marie Kondo and the de-cluttering craze, and Hallie explores the relationships built by professional organizers and their clients—showing just how easily the lines between professional and personal can be blurred. Hallie Ephron is the New York Times bestselling author of Never Tell a Lie, Come and Find Me, There Was an Old Woman, Night Night, Sleep Tight, and You’ll Never Know, Dear. She grew up in Beverly Hills, the daughter of Hollywood screenwriters, and lives in Milton. Don't miss the opportunity to line up your next great read! Join us for Teen CookBook Club! The selection is TBD by TBD. You can stop by and look at the recipe book in the Teen Room between the hours of 2:30-5:30 from Monday-Friday. You must make a dish in order to partcipate. No two people are allowed to make the same dish, so please relay your selection to Magda, in person, at the Teen Room between 2:30-5:30pm on Monday-Friday or send an email to miteen@ocln.org by 5pm on Tuesday, October 1, 2019. This program is limited to 15 participants, with at least 5 required to run it. This program is for students in grades 7-12. Thanks! Library Director Will Adamczyk will hold his "Eclectic Book Group" this evening. The book to be read in advance is Last Cowboys of San Geronimo by Ian Stansel (c2017). This is a contemporary western debut about two brothers locked in a deadly feud, a woman on horseback trailing her husband's killer, and the inescapable ties of home and family. When Silas Van Loy flees home on horseback to avoid capture for his brother's murder, he is soon followed by both the police and his brother's we, Lena, who is intent on exacting revenge. She reluctantly lets her trusted stable assistant join her in a journey across the wilds of Northern California in the hopes of catching Silas for one final showdown. Stansel follows the chase and shares the story of the brothers' rise from hardscrabble childhood to their reign as the region's preeminent horse trainers, tracking the tense sibling rivalry that ultimately leads to the elder's death. This is a fully realized tale that challenges notions of the modern West, The Last Cowboys of San Geronimo will satisfy fans of Kent Haruf, Larry McMurtry, Molly Gloss, and Smith Henderson, and establish Stansel as a new voice in this grand tradition. 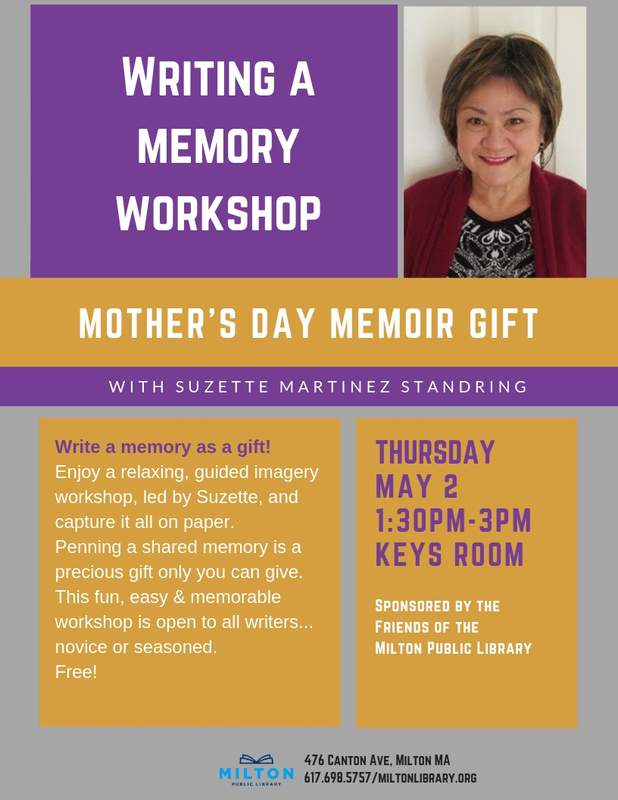 This program is sponsored by the Friends of the Milton Public Library and stop by the Reference desk to place a reserve on the book. Copies will also be available on our reserve shelf at the first floor Borrower Services desk. Join Will for an enjoyable read and discussion. 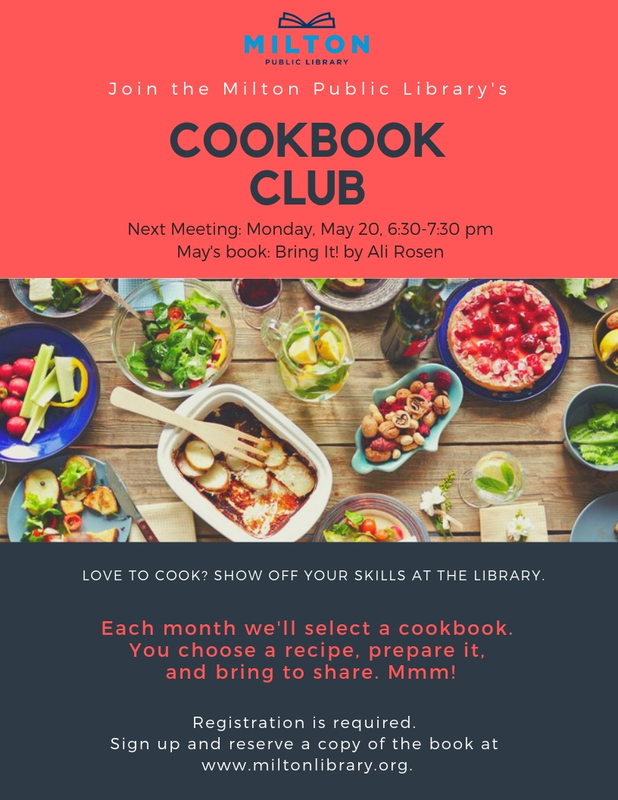 Join us for Teen CookBook Club! The selection is TBD by TBD. You can stop by and look at the recipe book in the Teen Room between the hours of 2:30-5:30 from Monday-Friday. You must make a dish in order to partcipate. No two people are allowed to make the same dish, so please relay your selection to Magda, in person, at the Teen Room between 2:30-5:30pm on Monday-Friday or send an email to miteen@ocln.org by 5pm on Tuesday, December 3, 2019. This program is limited to 15 participants, with at least 5 required to run it. This program is for students in grades 7-12. Thanks!